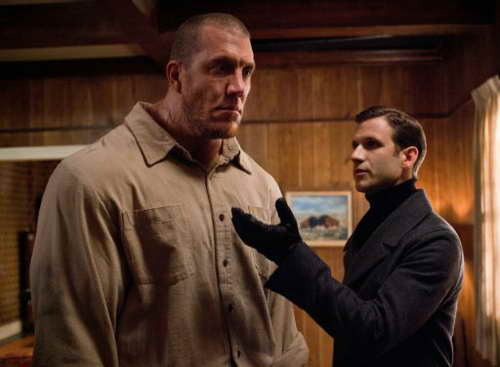 In case you were wondering, in the episode titled "Everybody Hates Hitler," which originally aired on Wednesday (2/6/13) episode of Supernatural, it was written by Ben Edlund and featured a really big fellow that played a great golem. 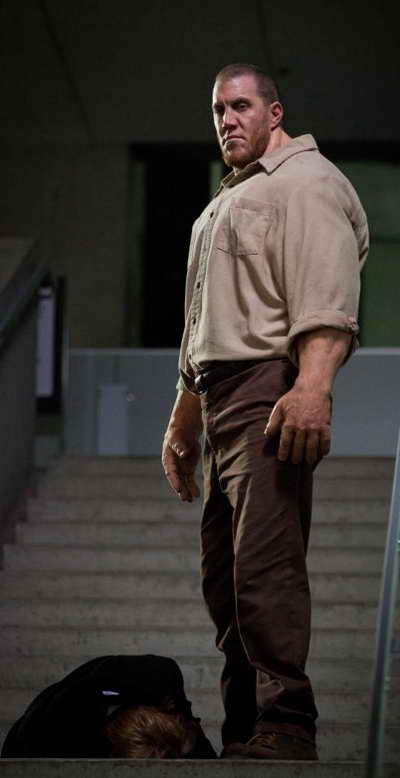 In fact, he was a very likable big golem in this case! Traditionally, a golem is either a clay figure that’s been brought to life or an automation/robot. It’s classic lore comes from a Jewish legend. But tonight on Supernatural, there was nothing clay about this boy! OK, he was made of clay, but was pretty tough! The golem in Supernatural was played by John DeSantis, and at first glance, he reminded me of the Dr Jekyl/Mr Hyde monster from the 2003 movie, The League of Extraordinary Gentlemen. But to be honest, I’m not sure where else I might have seen him. And I can’t believe I haven’t seen or remembered him from other things he’s done. The big guy, John DeSantis, is 6’9″ tall man and is known as one of the tallest actors from Canada. He’s been in 13 movies and had one-up roles in 29 different TV series. He was born in Nanaimo, British Columbia, Canada, and there’s not much more on him personally, that I can quickly locate. But I do have a bead on his acting resume! He held a recurring role in the 1998 series, The New Addams Family, as who else, but Lurch. He’s played Jaffa in Stargate SG-1, a mangler in Dark Angel, and held a recurring role in Blade: The Series. He also played three different characters in three different episodes of Smallville. Oh, check that out… he played a “Seven Foot Tall Man” in Psych. Go figure! Of the 13 different movies he’s been in, he’s held roles in The 13th Warrior, Thir13en Ghosts, Master and Commander: The Far Side of the World, The Hole, played Frankenstein in Stan Helsing and 30 Days of Night: Dark Days. He also performed stunts in AVPR: Aliens vs Predator – Requiem. (Stuntman is part of his resume.) And if by chance you remember a Sprint/Nextel TV ad about what if Lumberjacks Ran the World, well, he was in that too. The first time it showed the golem I thought “Hey Mr. Hyde yer in the wrong story!!!”. Very interesting similarities between the two characters. So there ya go, if you were curious, who the golem was! A very big man.